Almost no commercial fishery exists for shortbill spearfish. They are caught by sports fishermen, and incidentally by fisheries targeting tuna or swordfish by various fishing methods including pelagic longline, handline, pole, and purse seine. Shortbill spearfish are resilient to fishing pressure since they are found worldwide, mature at a relatively young age, do not aggregate to spawn thus making them more difficult to target by fishermen, and are highly fecund. There is almost no information available on the population status of the shortbill spearfish as they are not a targeted species. The stock status is unknown. 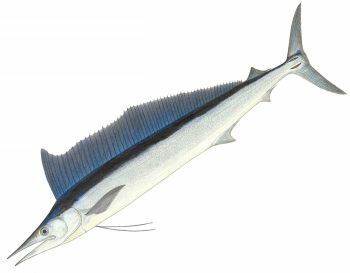 Shortbill spearfish are federally regulated together with other pelagic fish. There are no trip, size or quota limits, but there has been a significant effort to enforce bycatch laws. The extent of the bycatch depends on the fishing method used to catch the spearfish. With pole and handline, the amount of bycatch caught is negligible. Conversely, the amount and type of bycatch caught with pelagic longlines is of great concern. Sea turtles, seabirds, marine mammals, sharks, and fish are routinely caught. The methods used to fish shortbill spearfish do not cause great damage to the ecosystem. However, it is important to note that the use of pelagic longlines is detrimental to the abundance of large predatory fish in the ocean, and is thought to be one of the leading causes of their declines.